The single use USB data logger has 4 LED alert indicators. Two LEDs on the high side and 2 LEDs on the low side. 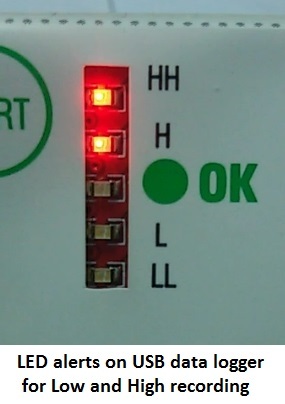 The middle LED in green colour is to indicate that the recording has been within the limits. This is a disposable USB temperature data logger mainly fo transportation purposes.